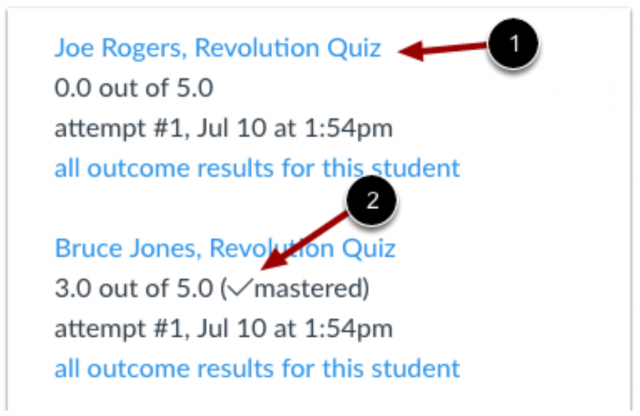 What are Learning Outcomes in Canvas? Outcomes are a standardized measure used to track competency or mastery in a course or across a program. Outcomes can be aligned to assignments, quizzes, and discussions to track students development as they complete activities. Many units have developed learning outcomes that are available for use in their programs. You can click on the Outcomes link and then select the Find button to see any that are available to you. You can create new Outcomes at the course level, but in many case you would want to use Outcomes that have already been defined for a program. Contact your local Canvas administrator or email 4help@umich.edu to discuss building outcomes for your program. How do I view outcome results in a course? Instructors can select the Learning Mastery button under the Grades link in Canvas. This view displays a row for a students and a column for each learning outcome. The cells show a color-coded score indicating how the student is performing towards a particular outcome. How do I view outcome results for an individual student at the program level? Users with appropriate permissions (e.g. sub-account admin) can access the Student Outcomes Results from the sub-account level under the Users menu. The report shows the Outcome, Attempts, Latest Score, and Average Percent . You can also view the artifacts linked to the Outcomes . How do I view outcome results for a program of courses? Users with appropriate permissions (e.g. sub-account admin) can access the Outcomes Report from the Report tag under the sub-account Settings link. Users with appropriate permissions can view all the learning activities across all courses that are aligned to a given learning outcome. Aligned Items are identified with an icon displaying the item type: rubric  or assignment .